Okay, so this camera isn’t a photographer’s dream. Nor is it the sort of camera you’d want to travel with. Nor is it a camera any adult, no matter how LEGO-loving, would want to use in public. But the LEGO camera is a great first camera for a young LEGO-loving photographer-to-be (say, 3 to 6 years old). 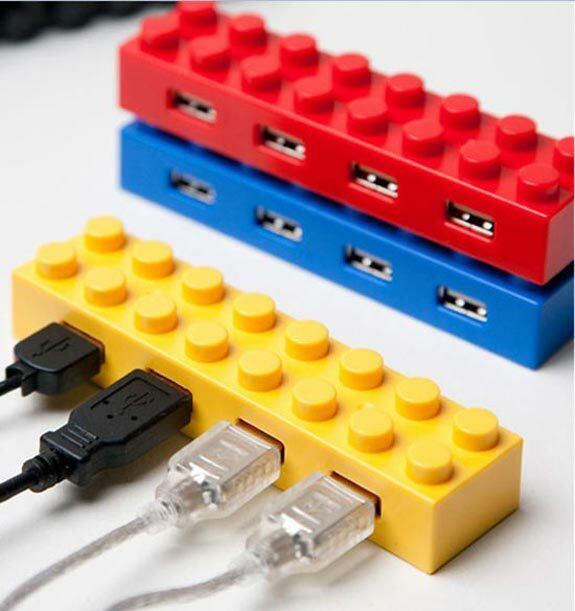 It’s ruggedly built, uncomplicated to use and looks especially snazzy when paired with a LEGO carrying case. Most fans of the Nintendo Wii are also fans of its LEGO-themed video games. (Spot Cool Stuff is especially partial to LEGO Star Wars). 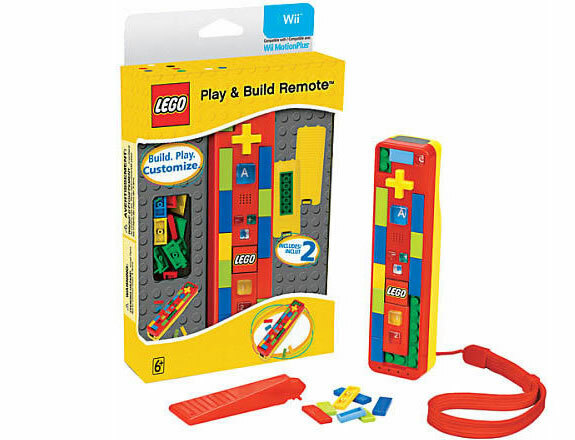 And so what better way to complete the LEGO Wii experience than with a LEGO Wii controller? The coolest part: You can attach regular LEGO pieces to spots on the front and back of the controller to create a customized look. 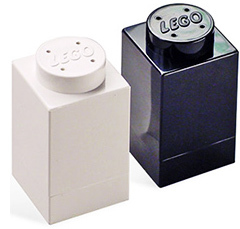 Turns out, there are more LEGO salt & pepper dispensers than you can shake a LEGO stick at. Of the three here our favorite might be the one in the photo below—it’s from Swedish designer Joel Hesselgren and looks like it was built from ordinary LEGO pieces. 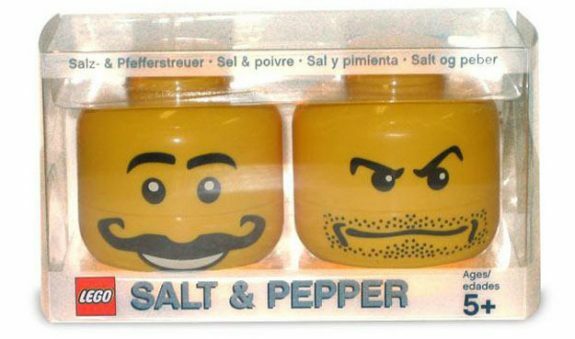 Indeed, its top is an ordinary LEGO piece and controls whether the shaker dispenses salt or pepper or both or none. Sadly, it is not yet for sale. So, consider building your own out of standard LEGO pieces. Or check out our photos of two commercially available shakers. 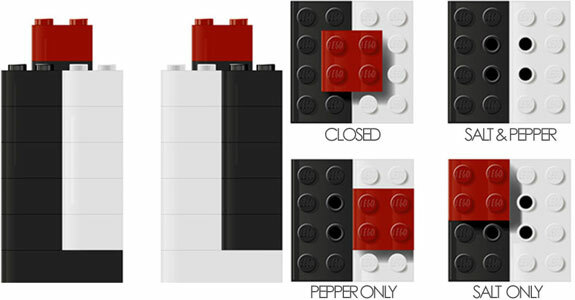 Don’t put LEGO pieces in your mouth! 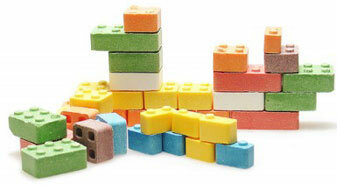 Candy that’s shaped like LEGO bricks goes against those two directives you were likely given repeatedly as a child. But that doesn’t you have to follow them as an adult. One is a USB flash drive, available in multiple colors at 2GB of storage but, inexplicably, only in green at 4GB. The other is a four-port USB hub. Hubs can be attached one another. 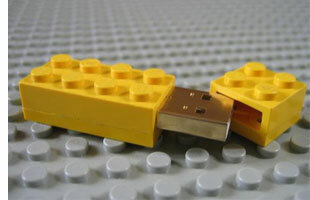 For an overload of LEGOness use multiple LEGO flash drives in the LEGO USB hub. Betty Crocker and LEGO might be an unusual combination, but it’s a delicious one too. A LEGO cake can be virtually any flavor. The trick is using large marshmallows to create the distinctive LEGO brink dimples. Lots and lots of red, yellow and blue food coloring is required too. 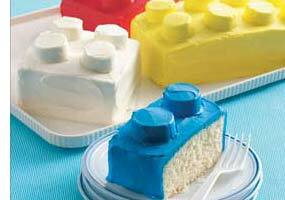 Check out the Betty Crocker website for a how-to LEGO cake making video. 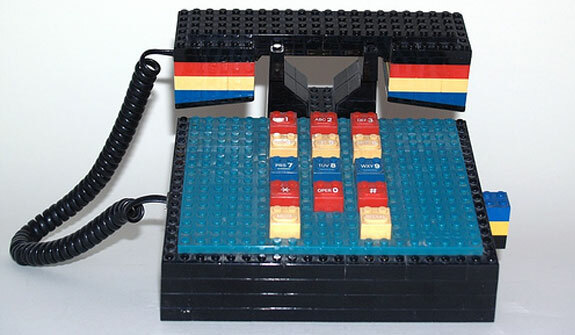 If not for the scroll bar one could easily mistake a wireless Brick Computer Mouse for an oversized, slightly cracked, LEGO piece. The illusion is less convincing with the USB wired mouse. Sadly, the bottom of a Brick Computer Mouse is flat so they can’t be attached together LEGO-like to build a super-mouse. It is a sad irony of life that the sort of man who is most likely to crave a LEGO wedding ring is also least likely to get married. 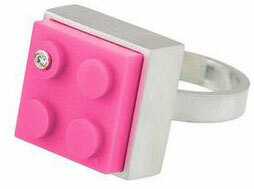 But should he find an equally LEGO-loving mate then a LEGO Ring would be ideal for sealing the nuptials. Rings come with four, two or one LEGO dimples; the latter two are more feminine. Real LEGO pieces can be attached to the rings as can all manner of charms and knick-knacks—see the online store for examples. As for what to do after your LEGO wedding, we suggest a LEGO honeymoon. LEGO artist extraordinaire Nathan Sawaya has built all manner of masterpieces out of toy construction bricks, from enormous statues to abstract renderings. 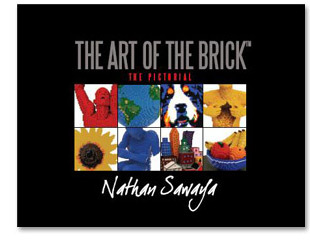 A selection of his pieces are touring museums around North America, though you can check them out anytime in Saway’s cool book The Art of Brick. But what if you aren’t satisfied looking at LEGO art and want to be LEGO art? Hire Sawaya to build a life-sized building block version of you. All you’ll need several good photographs of yourself. That and US$60,000. A wrist watch made from real LEGO pieces would be frustratingly clunky to wear. 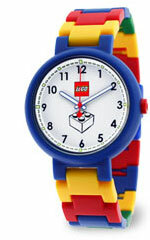 Try this LEGO wrist watch instead. It’s brightly colored, water resistant—and a lot thinner than an actual LEGO piece. 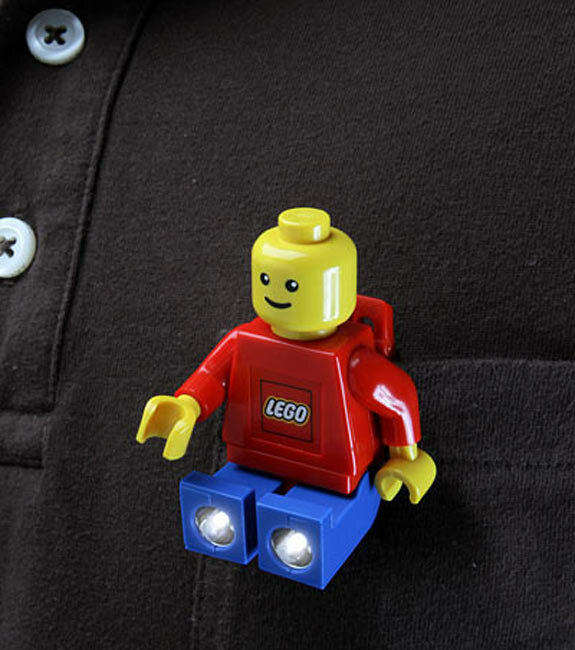 There’s no need to go cave spelunking alone—take this shining LEGO construction worker with you. He attaches onto a velco head strap and shoots LED light out of the bottom of his bendable legs. He has a clip on his back so he also attaches to all manner of places from a shirt pocket to, if you are so inclined, a Christmas tree branch. 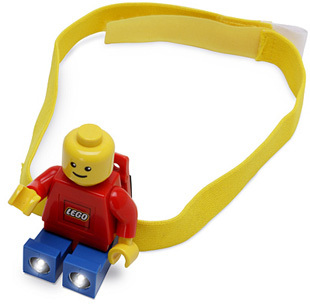 And he has no removable parts, making the LEGO Headlamp is suitable for kids 3 and up. A bargain for $11. I think I’ve seen a few of these before, like the ring, but some of those are super cool! 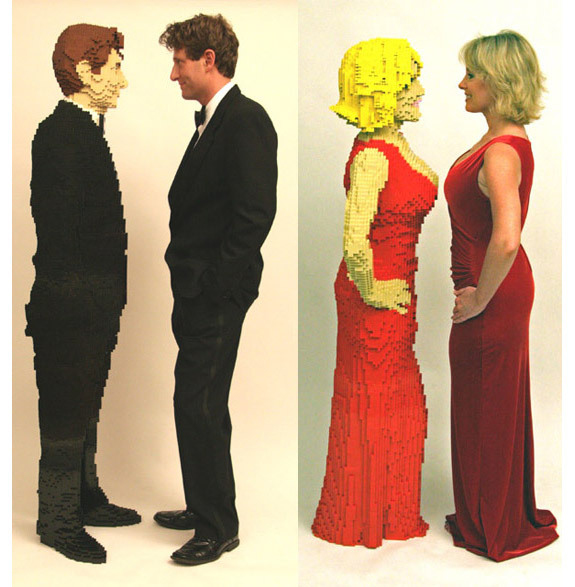 Those life-size Lego yous though – kind of crazy! Take LEGOs to the next level! It just may be impossible to exhaust the creative potential of LEGO bricks.